Author. Writer. Novelist. Three terms I never dreamed would describe me. But this December, it became official when I published my first novel. Even then, I still had difficulty believing it. But Friday afternoon, surrounded by dozens of friends and co-workers, I made my debut as Novelist Cat K. Thompson at my first book signing event. It was an amazing event planned and executed with great care by some of my closest friends, each food and beverage chosen to pay tribute to some setting or special moment in Once in Love with Lily. 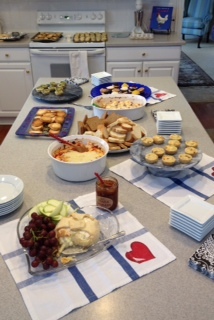 Guests enjoyed quiche, Brie En Croute, and Reuben and New York Style Pizza dips. 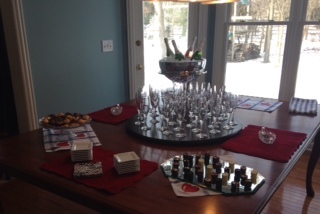 Plenty of champagne was on hand for toasting and we topped it all off with cheesecake, éclairs and Starbucks coffee. I will never forget the intense feelings of joy and the swell of pride I experienced. And knowing that I have the love and support of so many made my accomplishment just that much more meaningful. Not only that, but now, after signing my name on over forty dedicated copies, I feel confident saying… Yes, I am… an AUTHOR! 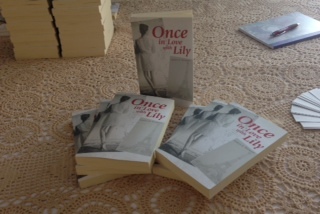 Copies of Once in Love with Lily ready to be signed. Champagne for toasting… The good stuff! 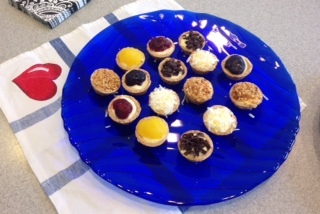 Cheesecake course! Not Fluffy’s, but still delish! Congratulations! I just bought the book and look forward to enjoying it while we are stuck inside during the deep freeze. Thanks! Hope you enjoy it. Stay warm!